The 1920s was the decade that marked the beginning of the modern music era. the music recording industry was just beginning to form and a myriad of new technologies helped to create the way music was made and distributed. The phonograph was invented by Thomas Edison in 1877 and it used wax cylinders to play back recordings. This invention lead to a recorded music market that began to appear in the 1880s. The gramophone was then created in the late 1880s and it used flat discs to reproduce sound, becoming popular in the early 1900s and replacing the phonograph. The way the music was recorded changed in the mid-1920s when the acoustical recording process was replaced with the electrical process. This change made the way that recordings were made sound much better and more natural, helping to expand the popularity of recorded music. As the recording process improved, a number of independent record labels also began to appear during the 1920s. These record labels helped to expand the modern music industry because they took risks and and were more adventurous with their song and artist choices. Prior to the creation of the recorded music industry, popular music was shared through sheet music, piano rolls, and live shows. The second influential technology that helped to create the modern music industry was commercial radio. The first radio was created by Guglielmo Marconi in 1894 and by the 1910s the first commercial public radio stations begin broadcasting in the United States. Many of the first radio stations were owned by newspapers, radio manufacturers, and department stores and did not use the advertising and sponsorship that is familiar to audiences today. Once radio became widespread and popular, the worlds of radio and recorded music began to merge. The music recording industry's profits dropped with the proliferation of commercial radio during the Twenties. Beginning in 1923, the American Society of Composers, Authors and Publishers (ASCAP) required licensing fees to play their music on the radio. A final influence on the music industry came near the end of the decade when silent movies turned into "talkies," incorporating recorded sounds and creating a whole new venue for the distribution of popular music. Movie versions of Broadway musicals became extremely popular and introduced different types of music to audiences across the world. What we all know as the modern music industry began in the 1920s with all of these new technologies that were created and used to make and distribute music. The music world was wide open making way for the popularization of genres like Jazz, Blues, Broadway and Dance Bands. Prohibition of alcohol began in 1920, this lead to an underground market for much sought after drinks and the creation of places like speakeasies. Speakeasies started out small, but as the Roaring Twenties came into its prime, speakeasies followed and expanded into clubs that featured musicians and dancers. Speakeasies weren't the only places that offered a party during the Jazz Age, there were private clubs, dance clubs, jazz clubs, and roadhouses. All were places where people could gather, listen to new music, and try out the latest dance crazes together. Dancing was a large part of popular culture and music during this decade and there were a number of iconic dances to emerge from these scenes. Dancing represented the carefree and excessive leisurely lifestyles that many had and tried to emulate during one of the first huge boom periods of American History. Nearly every town in the country had some form of dance band and a place to gather, making dance music some of the most widely heard and accepted music to come out of the 1920s. Dance music laid the foundation for what would become classic pop standards. The "Charleston," the "Black Bottom," the "Shimmy," the "Foxtrot," and the "Lindy Hop" were some of the most popular dances of the time. Most dance music resembled what we would call Big Band today, but at the time it was considered Jazz and it had elements of the formerly popular Ragtime music. The most famous and recognizable dance from the twenties was the Charleston. The Charleston was introduced to the world in the 1923 Broadway show "Runnin' Wild." The was a song from the show called "The Charleston" and it was done in a style similar to Ragtime music. Ragtime music was popular up until the late 1910s and was a heavy influence on dance music of the early 1920s, while jazz heavily influenced dance music in the late 1920s. There were several bands and orchestras that had hits with dance music during the decade and many of them transitioned between different genres depending on what was the most popular at the time. Some examples of popular dance bands were Paul Whiteman and his Orchestra, the Fletcher Henderson Orchestra, Ben Bernie and his Orchestra, and the Nat Shilkret Orchestra. Another aspect of dance music in the 1920s was the dance competitions and marathons that were held across the country. Radio stations, stores, and other commercial operations would hold competitions for prizes where couples would compete in seeing who could dance for the longest, with some people dancing for days. Other competitions would feature scores of girls seeing who could dance the best Charleston for the longest. The popularity of dance music also influenced the fashions of the decade with looser fitting clothing like "Flapper" style dresses for women, and more casual sportswear for men becoming widespread. While these types of clothing were not necessarily created with dancing in mind, their easy fit and styles made them ideal for the flamboyant and active dancing that dominated the decade. Jazz music began in the early 1900s within the black community in New Orleans. It was a new type of music that combined European and African styles. It is a difficult style to define as it incorporates several different elements of several different styles, relies on a lot of improvisation and syncopated rhythms and is subjective in many ways. Jazz music reached the mainstream in the 1920s when Southern African American musicians began moving up to Chicago looking for work. The Twenties are often called the Jazz Age because the popularization of Jazz music had an enormous cultural effect. Jazz music was important because it influenced fashion, dances, accepted moral standards, youth culture, and race relations. Jazz music was one of the first types of music to be culturally appropriated by the American white middle class and Jazz scholars often separate the music into "Jazz" and "White Jazz," marking a difference in style and meaning between original African American jazz artists and popularized white jazz artists. Jazz music was popular on the newly booming radio networks and it was one of the ways that white musicians appropriated and popularized the music as many national stations refused to play records by black artists at the time. Two predominant black artists that had popularity and played in jazz bands were Louis Armstrong and Duke Ellington, one influential white jazz artist at the time was Bix Beiderbecke. Jazz gained popularity and spread through the country in clubs, speakeasies, and dance halls where Jazz bands would play their new music. Many of the clubs were segregated and would only allow white bands in white clubs and black bands in black clubs. Some popular African American bands playing in white clubs where black patrons were not allowed. There were very few integrated clubs around and they were called "Black and Tan" clubs. The most famous jazz musician of the decade and possibly of all time was Louis Armstrong. Armstrong was a popular African American jazz musician who played the trumpet and cornet and was known for his distinct and gravelly singing voice. Armstrong's talent helped him break down some of the racial barriers of the time as he played in several mixed race bands and was invited to play in white only clubs. Some of Armstrong's notable hits from the decade included "Heebie Jeebies" from 1926, "West End Blues" from 1928, and "Ain't Misbehavin'" from 1929. Another influential Jazz musician from the Jazz Age was Duke Ellington. Ellington was a jazz band leader and a pianist. He was an influential figure in the jazz community but he also did a lot for general popular music and dance music. He was also a popular figure who frequented whites only jazz clubs to perform. A couple of Duke Ellington's popular songs from the 1920s were "Creole Love Call" and "Black and Tan Fantasy" both recorded in 1927. A third influential jazz musician of the decade was a white cornetist and pianist named Bix Beiderbecke. Beiderbecke's style contrasted with Armstrong and he is thought to have had an equal influence on the early jazz scene like Armstrong. 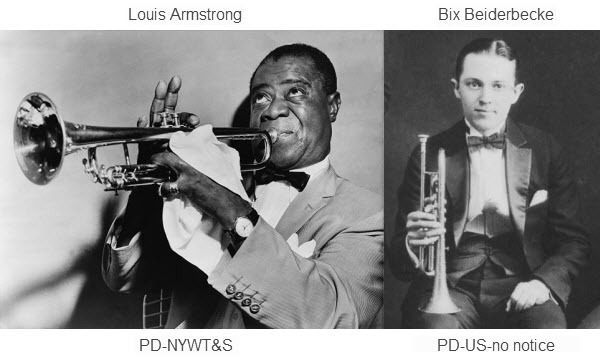 Many jazz authorities say that two distinct styles of jazz were formed from the 1920s, and the two styles can be traced to the original styles of either Louis Armstrong or Bix Beiderbecke. Armstrong was a highly trained musician and was considered a virtuoso, while Beiderbecke was self-taught and therefore had an unusual style. Jazz was the defining sound and style of the 1920s and has continued to be a popular art form that has a constantly changing musical landscape. Beiderbecke's famous recordings included 1924's "Riverboat Shuffle" and 1925's "Davenport Blues." The first popular blues music began appearing in the late 1900s and early 1910s. Blues music likely originated earlier than that in the African American communities in the Deep Southern states of the US. 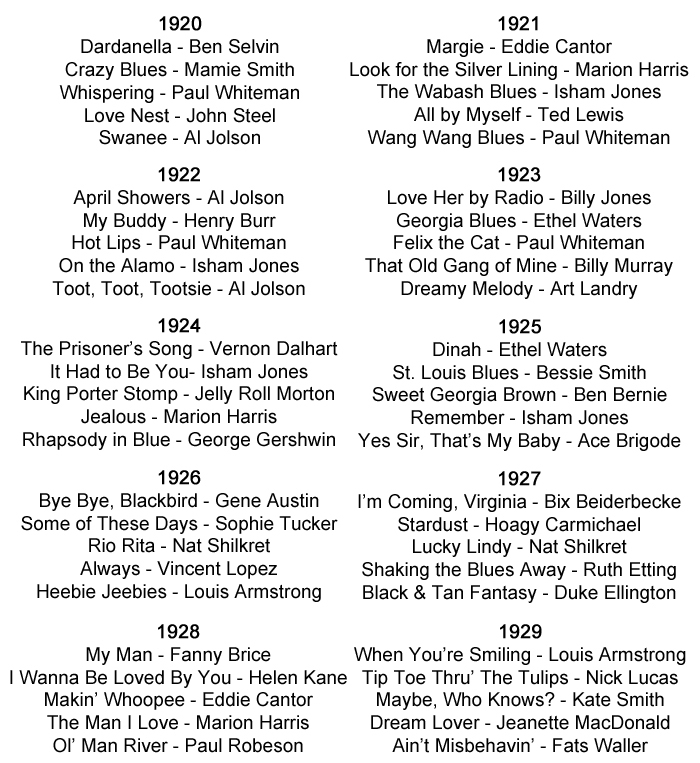 Blues music is characterized by repeating chords and 1920s blues focused on a twelve bar structure. Songs would often chronicle the singers personal troubles and the daily racial problems associated with being African American in the prejudiced and segregated South. Some blues songs were also witty and comical, a satirical take on a melancholy life. During the Twenties, blues was almost exclusively played by black musicians and was only popular within the black community. One of the most important blues singers of the decade was Mamie Smith. Mamie Smith is credited with making the first recorded blues vocal performance by an African American singer in 1920. The song was called "Crazy Blues" and it was hugely popular with an African American audience, helping to create a market for "race records," recordings that were specifically marketed to a black audience. 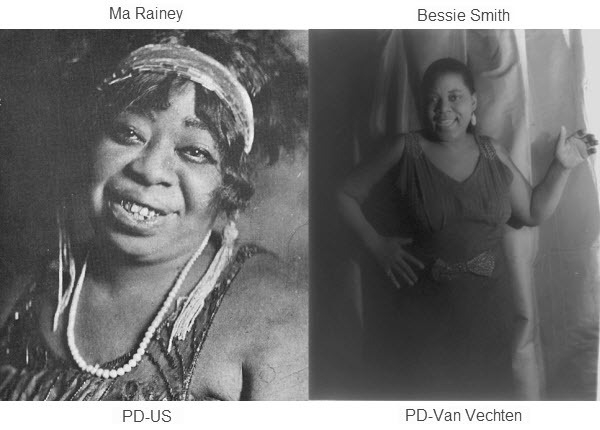 Another important blues singer from the 1920s was the "Mother of Blues," Ma Rainey. She was also one of the first professional blues recording artists and was known for having a powerful voice. Rainey was suspected by many to be bisexual or lesbian and is thought of as one of the first influential voices in the LGBTQ community as many of her songs openly referenced lesbianism. Some famous Ma Rainey songs include 1924's "See See Rider," 1927's "Black Bottom," and 1928's "Prove It on Me." While Ma Rainey was the "Mother of Blues" another artist, Bessie Smith, was considered the "Empress of Blues" in the 1920s. Bessie Smith was one of the highest paid African American performers of the decade and had several blues hits during the twenties, including "Downhearted Blues" and "T'ain't Nobody's Biz-Ness If I Do" from 1923 and "I Ain't Got Nobody" from 1926. She was known for her incredibly strong vocals. A final important figure in 1920s blues music was Blind Lemon Jefferson, a singer and guitarist who had a distinctive style that made him a hugely successful recording artist in the early days of the music industry. He was one of the first solo voice and guitar artists to find success in the recording industry and was thought of as an innovator. Blind Lemon Jefferson's most famous songs included "Matchbox Blues," "See That My Grave is Kept Clean," and "Black Snake Moan." Blues has remained popular since the 1920s and has changed and evolved with its own trends over time. The film industry was somewhat established by the 1920s and silent films were the only types of movies around to dominate the big screen. By 1923, synchronized sound in films was making great strides in the development of the technology and the first short films with synchronized sound were being created. By the mid to late 1920s the first full-length talking movies ("talkies"), were being created and commercialized. With the advent of talking movies, the next natural step would be musicals. Prior to the creation of talking films, musicals were often originated in the theatrical Broadway area of New York City. Broadway became a place where talented performers, composers, writers, and musicians gathered to create new art together. It came into its own during the 1920s and was a place where creativity and decadence thrived. Composers like George and Ira Gershwin, Cole Porter, and Irving Berlin flourished in their creation of musical theater. Many of these composers works were then turned into the first musical films, where they found whole new audiences across the country. Broadway music found a home in the new synchronized sound films and America was introduced to a new and modern musical theater, a blend of classical and innovative musical styles, juxtaposed with exciting stories that reflected the current era. Some examples of Broadway shows turned into musical films during the 1920s were "Sally" (1920 stage musical to 1929 film), "Rio Rita" (1927 stage musical to 1929 film), "Show Boat" (1927 stage musical to 1929 film), "Sunny" and "No, No, Nanette" (both 1925 stage musicals turned into 1930 films). When musical films were not directly taken from stage musicals, they often used Broadway as a subject and back drop, taking place in the world of the stage. Some examples of these musicals include, "The Jazz Singer" (1928), "The Broadway Melody" (1929), "Gold Diggers of Broadway" (1929), and "Broadway" (1929). Broadway music in the 1920s was heavily influenced by Jazz. 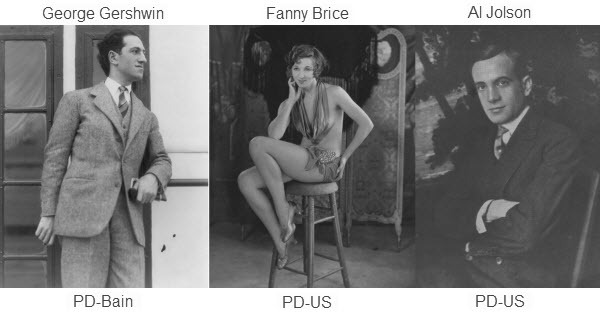 Popular Broadway performers began making their way to the film and music recording industries where their signature performances could be chronicled and distributed to the masses through movies and records. Famous stars to emerge from the Broadway scene included Fanny Brice, Al Jolson, Sophie Tucker, and Ethel Waters. Many of the early Broadway composers were rooted in classical music, but the spirit of the decade begged for innovation and encouraged composers like George Gershwin to mix the modern with the old. Gershwin's masterpiece "Rhapsody in Blue," introduced in 1924, perfectly melded classical with new jazz and it emerged the most iconic and representative song of the 1920s.